Your Confidence Directly Impacts Your Revenue: Business Strategy - Brilliant Breakthroughs, Inc. 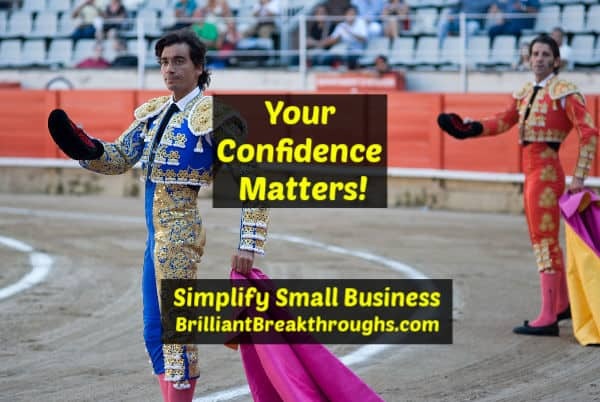 Your confidence can make or break your small business! Let’s get you on the right side of this! What are you doing to boost your confidence level? This past week I had several people and clients share that they are (a) “lacking confidence to do their job well”, (b) asking me, “How I can be more confident?”, (c) said they are “unsure of what they want for their business’s success“, or (d) “you are so strong, how do you do that?” OK, so if that wasn’t enough clues regarding what I should write about., I just finished a mini-training and guess what, the presenter was speaking about: confidence! I absolutely love this quote from Eleanor – it speaks to the first step of the process so well! We must first have courage to do something that freaks us out. Then, we step right into it with both feet! Only then, through facing the fear, we become courageous and build confidence. An unwavering confidence, which may be renamed assurance. It is this assurance (being sure of oneself) which cultivates your confidence. Most people think you need to have courage to be strong. It’s actually the reverse. Do you speak with solid confidence to your customers, potential customers, or strangers? If not, your lack of confidence is hindering you from increasing your revenue! Do you know why your current and past customers have found you so invaluable? If not, ask them and find out what you can provide for others! Do you feel like you are asking permission to speak about your business’s solutions? Remember, if you don’t share why you and your business exists, who will? Do you feel awkward when you must introduce yourself to someone? Make sure you understand the gains you offer customers. Do you wish you had more self-confidence in the services you offer the world? Only you can share how much you enjoy offering YOUR business’s solution to others! Do you really know that people are waiting to learn about you and your solution? Let them feel how enthusiastic you are about sharing your solutions! Do you need more knowledge to be a specialist in your industry? Do you share your solutions and feel that when people ask questions it is “a problem”? Not closing enough business these days? If you aren’t closing the sales you believe you should be, your confidence may need a booster shot! This may not be as complicated as you are making it. What if you could have a quick conversation (No Cost Consultation) to identify your sales gap? We will identify if it’s your confidence, your marketing, or your sales technique that’s keeping revenue out of your reach.